Four bottoms are needed for a Suduko wardrobe. I had specific plans for one block (that’s coming next week) and I knew one would be jeans (because…jeans). Leggings, or slim pants, seemed like a good idea to work with the floral tunic, but that still left one more. I played around with the fourth block…a fitted skirt? a midi skirt? Shorts? or pants? After searching through my pinterest boards I decided on wide leg pants. 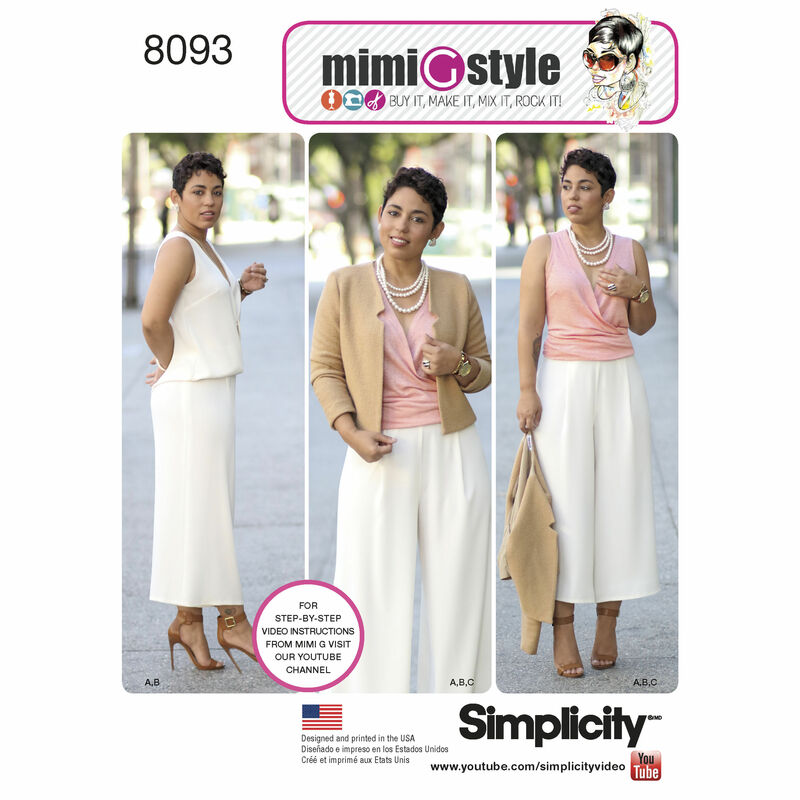 I considered McCalls 7483, but decided on Simplicity 8093 because of the cropped length, which I felt perfect for a spring wardrobe. The pattern calls for crepe or linen on the back of the envelope. Though I did use a linen look, I think any light-medium weight woven with some drape would work nicely like a challis, chambray or light weight denim. As far as color, I knew I wanted to pull something from my inspiration fabric even though these pants wouldn’t be worn with those pieces. I’m not a lover of pink so that was out. Turquoise was eliminated next because even though I love the color I couldn’t see getting much use out of turquoise pants. It was sort of a toss-up for me between purple and green but Joann made it easy because they actually didn’t have a purple that went nicely with the pattern. Which left me with this Palm green. Which was actually awesome because I treat olive/army/camo green as a neutral, so it was the best choice anyway. Little did I know this is like “the” color for spring. I don’t clothing shop often since I’ve started sewing but I walked into Target and everything is olive green, EVERYTHING! This palm green is from Joann’s Amaretto Linen Look line, but it is actually not linen at all but instead 50% polyester/50% rayon. If you want linen they do carry linen suiting, linen slub and linen solids but none of the color options were green. If you want at least some linen content but something other than neutral colors try the linen look solids or linen look hopsack collections. They even carry a tissue linen in gray and white. Here’s a link to all their linens. Another great source of high quality 100% linen is Fabric Mart, check out their designer linens. I was able to fit the size 16 on 2 yards of my 60″ wide fabric by changing the pattern layout as seen here. Note that the front and back waistband and the pocket must be cut twice. I cut a 16 which has a 44” finished hip measurement (I’m a 41-42 hip) and was actually able to get all the pieces cut in just 2 yards instead of the 2- 3/8 yards the pattern calls for. Please keep in mind my fabric was 60” wide. Typically I add about an inch to the back crotch as a BBA (big booty adjustment) but I didn’t this time. Previously when I made another Mimi G pattern, S1019, I forgot to make this adjustment and the pants turned out fine, so I took a chance that these would as well. Thankfully they did. So thanks to Mimi G to looking out for us curvier women. I was surprised at how quickly I was able to sew these up, I almost constructed these pants in one evening. Now let me preface by saying I had already cut all the pieces earlier in the week. Still considering I serged all the pattern pieces before sewing them together and was able to go from a pile of pieces to pants (minus the hemming) in 3-4 hours wasn’t bad. The pants are very straight forward, if you’ve made pants before these will be simple. If you haven’t be sure to watch MimiG’s sewalong video on youtube. The only thing I could see being a challenge is the side invisible zip with the side pocket installation. The video covers this clearly though. I did note that the sewalong skips over the belt loop/carrier part, so remember that if you are sewing along with Mimi. I didn’t want the loops anyway so it was fine. If you do, just pause before you attach the waist band and follow the steps in the pattern instructions. Though I picked this pattern because of the cropped length I was actually very unsure about the length on me. Once I finished the pants I was even more unsure, but once I paired them with heels it was better. I played with hem widths. I pressed under ½” and then pinned a 1” hem on one leg and a 2” hem on the other. The 2” hem was a definite no go, so I unpinned that leg and folded over ½” and compared to the 1” hem. I decided on the ½” hem (so basically I folded over ½” twice) and topstitched the hem. For reference I’m 5’5”. A blind hem would have been even better, but I don’t usually have the patience to hand sew them or set up my serger for it. All in all I LOVE these pants and the cropped length is growing on me. I will definitely make them again, lengthening them to full length. I like these so much I will likely return McCalls 7483 because they are so similar. What do you think about the length? I’m still a tad unsure. Let me know in the comments. Also do you have a favorite wide leg pants pattern? Pattern alterations or any design changes made: I only used a 1” hem (1/2” double folded) instead of a 1 -1/2” hem. Conclusion: This is now my go to pleated wide leg pattern, the rest will be sold, lol. I seem to have a lot of this type of pattern. I am not a fan of cropped pants on myself. I feel too short. But I think these are a great length on you. The colour is lovely too! The length is perfect on you! They will probably come to my ankles because I’m a shorty! Lol! You look great!! They are cute!! I’m sewing a similar style from Burda this month hopefully. I bought a RTW pair from Ann Taylor and without shoes or anything other than a heel – no go. I’m 5’5″ as well. With heels I really like them. Much more so than I thought I would. Yes! When I first tried them on in bare feet my first thought was “Oh no!”, the heels definitely help. You have convinced me to try the cropped pant trend. I love these on you, bravo! I need this pattern. Thank you. You never know until you try!